The initial unique selling point of metasearch was to provide a wide, transparent offering for the traveller and a platform for airlines and online travel agents to access travellers across the world and across verticals – all whilst accessing unique data and trend insight, and evolving technology. In recent years, greater access to data has allowed brands to see the consumer as paramount to determining success or failure in the competitive travel landscape. This has driven the industry to shift from cutting to costs to focusing on improving the customer experience and brand loyalty. 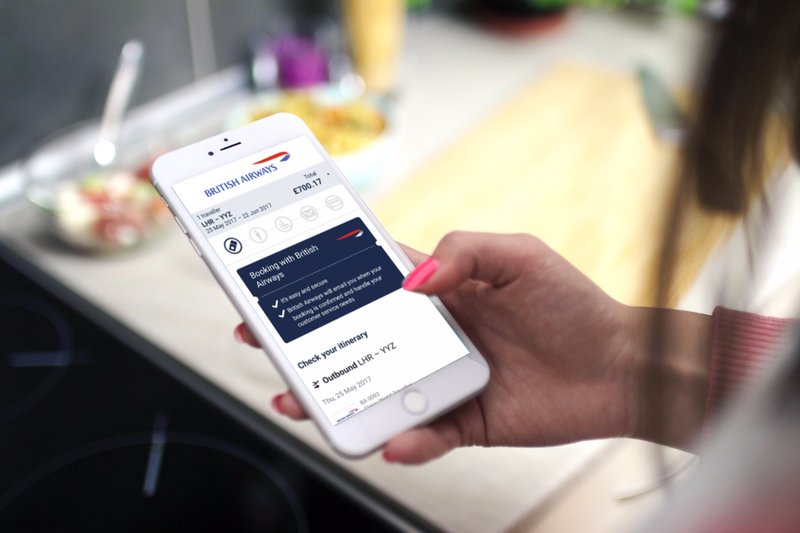 In this feature, we’ll explore how personalisation is applied at key stages of the travel experience, and how brands can utilise our technology and insights to ensure they’re keeping up with the industry. According to a study by eMarketer, nearly half of US marketers saw over 10% uplift in revenue after introducing personalisation to their websites. At Skyscanner, we operate with a user-centric mentality and use data to drive almost everything we do. Recognising the evolving demand for personalisation in a world with growing digital deafness, we’ve started investigating how to leverage this trend to drive growth for our partners and serve our travellers’ needs. Critically, marketing has evolved from a 'build a product and they will come' approach. Traditional methods of building brand loyalty initially stood within marketing activities, but this is difficult to apply to the meta model. With an excess of products, content and offerings in the marketplace, brands need to be strategic to ensure theirs can cut through the noise. A study by Amadeus highlighted that, with the industry becoming increasingly saturated, airlines and online travel agents are looking beyond prices, routes and segmentation to “better understand what individual travellers value” across key travel micro-moments like planning, searching and booking. The rise of consumer-to-consumer (C2C) marketing, in a generation of social media and the psychological phenomenon that is social proof, has highlighted how important it is for brands to consider consumers as key stakeholders. The ability to widely share information can be a game changer for brands, and given the social nature of travel, this is an even more important facet to consider. Studies have shown that consumers are more likely to trust another consumer over a brand, and this C2C approach allows brands to create a more personalised experience by allowing consumers the chance to gather information from people just like them. We welcomed Trip by Skyscanner to the organisation in November last year. In doing so, we’ve been able to leverage their capabilities in providing hyper-relevant recommendations and user-generated content to make travel search and discovery more personalised. C2C travel endorsement is lacking across the industry, and if airlines or online travel agents want to compete in the crowded industry, they must look beyond traditional methods of making a sale. Introducing personalisation into the planning stage, well before a user even decides to carry out a search, is a great way of doing this. Amadeus notes that, for travellers making a booking, there’s a crucial balance to be struck between product, service and convenience. Each traveller will place differing levels of importance on these factors, depending on the make-up of their flight “affecting the overall price that they are willing to pay”. More recently, we’ve seen brands changing the way they provide consumers with results to counteract this dynamic level of importance on product, service and convenience. Take our Flight Quality Score tabs on the search results page as an example. After looking at the data, our in-house data scientists used machine learning to develop the Flight Quality Score in response to this demand. This feature lets users filter and rank results according to price and quality, allowing them to assess value in a more straightforward way. 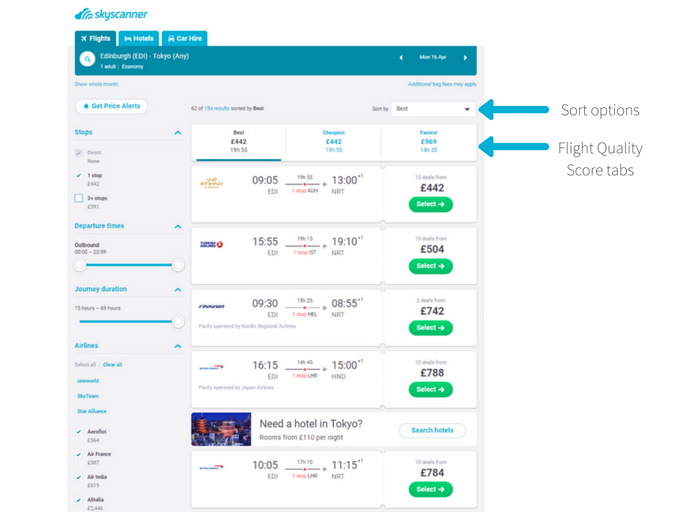 Using the results of Flight Quality Score, Skyscanner users can now filter by ‘Best’, in addition to the previously existing options of ‘Price’, ‘Total Journey Time’, ‘Outbound Departure Time’, ‘Return Departure Time’, ‘Stops’ and ‘Airline’. These options are available through our Flight Quality Score tabs, which highlight the ‘Best’, ‘Cheapest’, and ‘Fastest’ filtering options, and in our ‘Sort’ options as showcased below. Most importantly, we’re leaving personalisation up the user, allowing them to select whichever filter suits their needs. The impact has been significant: since it was introduced as the default option in August, the ‘Best’ filter has accounted for nearly 80% of exits in the UK, and the majority of users adopting this option have exited on one of the top three search results. ‘Price’ filtering has been selected and used as an alternative to ‘Best’ in nearly 19% of exits within the same period. Within the wider travel ecosystem, airlines and online travel agents need to harness data to better understand the complexity of choice when making a booking, so they can make it as easy and relevant as possible. Take Netflix for example: on a platform where options can seem endless, rather than promoting content designed to appeal to a broad range of users, Netflix allows consumers to build a list of similar options based on content they’ve already watched, making the choice much simpler. Our Direct Booking platform looks to respond to this change by offering a wide range of personalisation benefits for consumers, airlines and OTAs. Direct Booking is all about providing a flexible, optimised retail experience, bringing the right options to the top of the search in the increasingly small space of the mobile front page. It’s designed to put the retailer’s brand at the forefront and ensure a direct connection to the consumer, regardless of the context of purchase. The evolution of Skyscanner towards Direct Booking has already delivered returns for early adopters, with existing partners experiencing an uplift in booking conversions on basic tickets upwards of 20% across the board, and 50% on mobile. Additionally, there’s been an uplift in ancillary ticket sales of over 100%. This feature has broken down the ‘third party’ wall, and the industry must now keep up with this evolution towards providing a consistent, seamless experience. Brands such as Tmall have set the standard in online retailing and effectively demonstrate how branded storefronts offer the ability to up-sell products and increase brand loyalty. Personalisation now goes beyond content to encompass how we distribute that content to the traveller, be that through mobile, bots or voice technology. So, how is a brand supposed to know what a consumer wants? Despite developments in AI and machine learning, we’re a still a while away from mind reading. But for now, data should provide enough insight. Times have changed from marketers using data to validate success in terms of page views and churn. Consumers are more informed than ever and expect brands to know exactly what they want, when they want it; and if they fail, the consumer will find a brand that does know. In order to compete, brands should consider how to use content from fellow consumers; how they respond to complexity of choice; and how they can provide a more seamless and consistent experience. Flight Quality Score, Direct Booking and UGC are only a handful of ways in which we deliver value in response to this growing demand for personalisation. To gain loyalty, brands have to treat the consumer as king. You can find out more about any of our products or understand how you can deliver value through personalisation here. To learn more about partnering with Skyscanner, get in touch.